Here's a great example of how one cover-up was revealed and yet another perpetuated. My reading of the recent (highly recommended) book By Matthew Algeo "The President is a Sick Man" brought about this post. You will soon discover why. 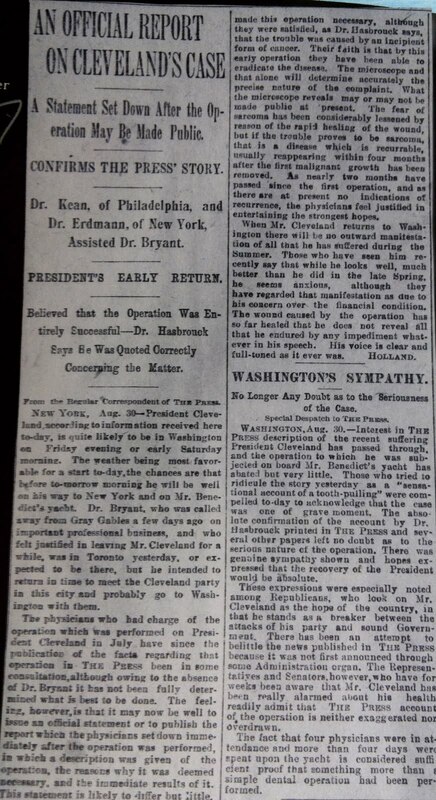 On July 1, 1893 Grover Cleveland had an extensive surgical procedure aboard the yacht Oneida to remove a (subsequently biopsy proven) cancer of the hard palate. A second surgery was eventually performed and he was fitted with a prosthesis (now in the Mutter Museum in Philadelphia) to replace the portions of his upper jaw (maxilla). of the Philadelphia Press published the following article exposing the absolute truth of the incident based on an eyewitness account. Two days later he followed it with a confirmation with even greater detail. 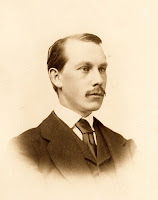 The White House, assisted by the reports of a rival newspaperman, Alexander McClure of the Philadelphia Times, went on a campaign to deny Edwards' story. wrote an article in the Saturday Evening Post that confirmed the story. Kean followed the story with a book, the first edition of which being a proud addition to my library. Kean lived to the ripe old age of 95. 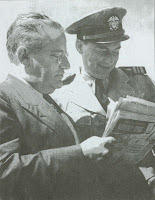 Kean was also connected to Roosevelt. 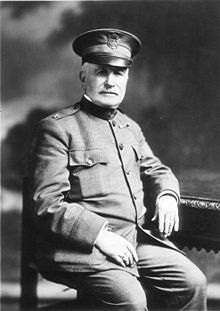 He was called to Campobello at he outset of FDR's polio in 1921 and misdiagnosed him as having a spinal cord infarction (stroke). Most famously, he submitted an outrageous bill for his services to the family. 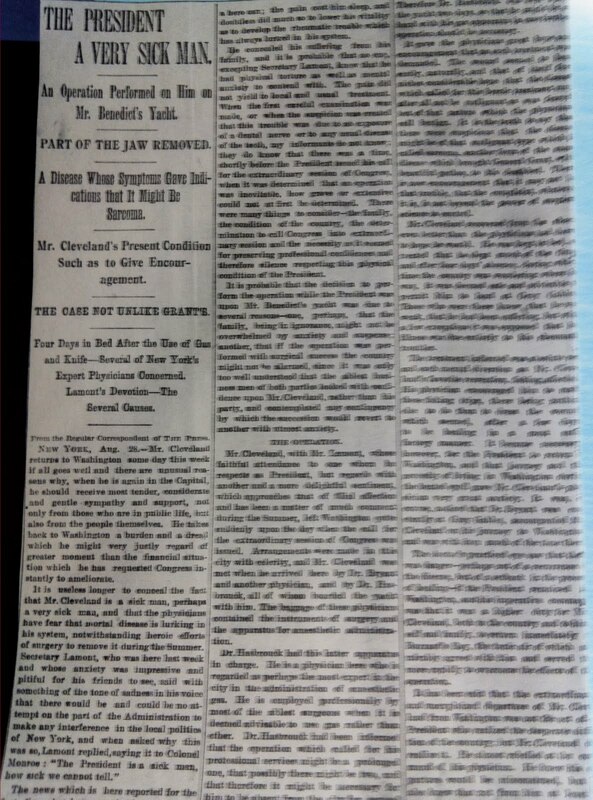 published on the front page of the Chicago Tribune, the following account of Franklin Roosevelt's (who died of cancer at age 63) health on the day after his death. Trohan lived to the ripe old age of 100 and was never publically villified for his article. 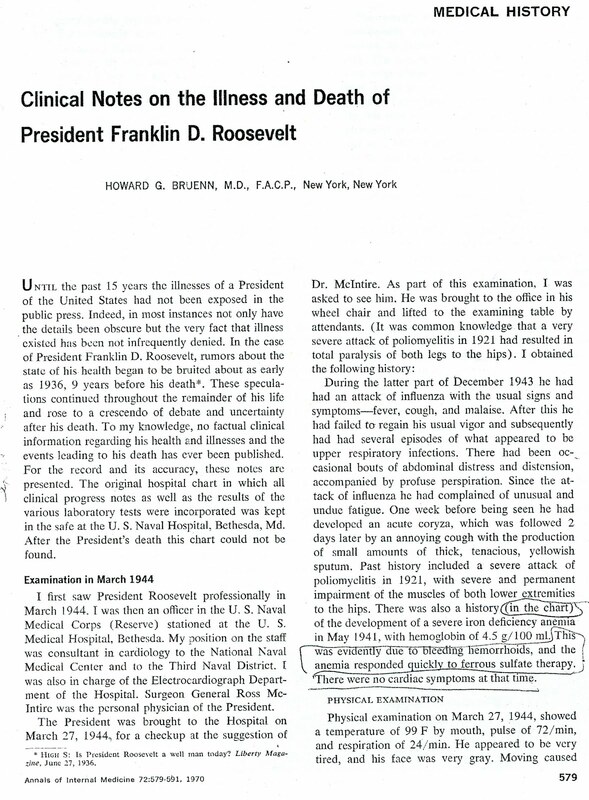 Presidential physician Ross McIntire simply ignored it, as did the American public. Twenty five years later, FDR's physician Howard Bruenn (here with Samuel Rosenman) published a paper that perpetuated and reinforced the cover-up, one that still needs to be continuously reiterated, despite our widely circulated book. 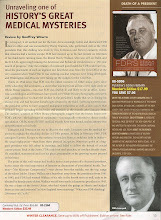 The ghost of Franklin Delano Roosevelt, the most powerful man of the twentieth century, continues to exert its influence. Eventually, acceptance of Roosevelt's cancer will equal that of Cleveland's. Unfortuately, the process will have taken more far more than twenty-four years! Sometimes doctors explode cover-ups after a quarter of a century- sometimes they perpetuate them.